Edith Skom returns, better than ever, with another clever tale of English professor and amateur sleuth Beth Austin. With her unique ability to twist a plot with humor, style, and flair, Skom is certain to meet her fans' great expectations. 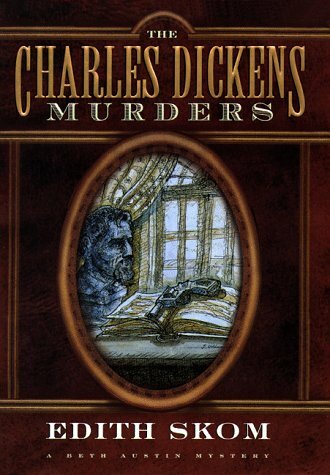 The Charles Dickens Murders is perfect for readers who enjoy the books of Amanda Cross and Elizabeth Peters. On a sweltering summer night, a woman is murdered in her hospital bed in New York City. Almost a thousand miles away, Midwestern University professor Beth Austin is leading a class through the complete works of Charles Dickens. The framework that connects this tale of two cities begins to unfold when Beth learns something she never could have imagined: forty years ago, her mother was involved in a treacherous love triangle at the University of Chicago. Disturbed by her mother's past of painful lies, secrets, and murder, Beth is determined to find out the truth-no matter the cost. As she delves into the story of the man her mother loved and her rival for his affections, Beth discovers that these old deadly secrets may well destroy her own dreams for the future. Edith Skom is the author of The Mark Twain Murders and The George Eliot Murders and has been nominated for the Agatha, Macavity, and the Anthony Award. She lives outside of Chicago, Illinois, where she is a lecturer at Northwestern University. Devout Dickensians could feel slighted by this third book in Edith Skom's literary-slanted series of mysteries: despite a few mentions of The Mystery of Edwin Drood and Bleak House, there's not much Dickens on view. But Skom creates such a lively picture of a group of women students at the University of Chicago in the 1940s that most readers will forgive her for not living up to their great expectations.